Sweet and Spicy Pulled Beef. 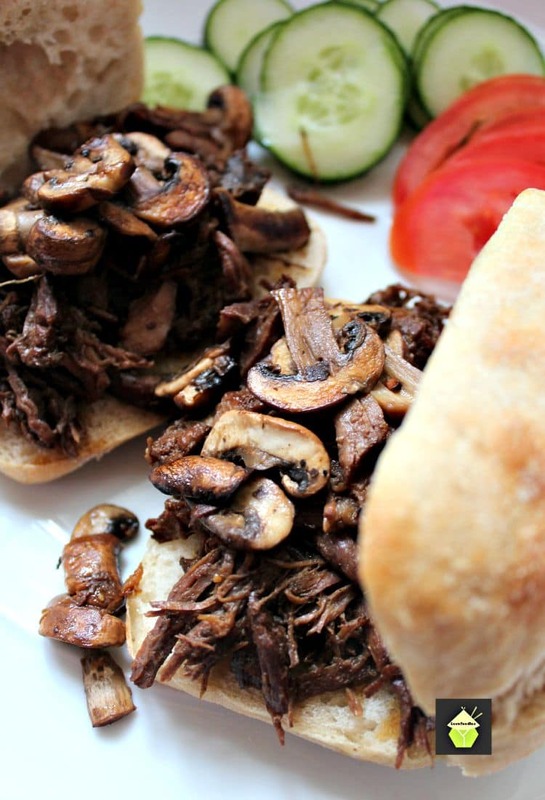 Slow cooked tender beef in a delicious sauce, simply served on a warm ciabatta roll makes for a perfect meal! Here, I’ve made a really tasty recipe, inspired from our friend Cathy’s French Dip recipe. I tried Cathy’s recipe and loved it so much, I decided to make something a little similar, only kick it up a notch or two with a few of my favourite spices. 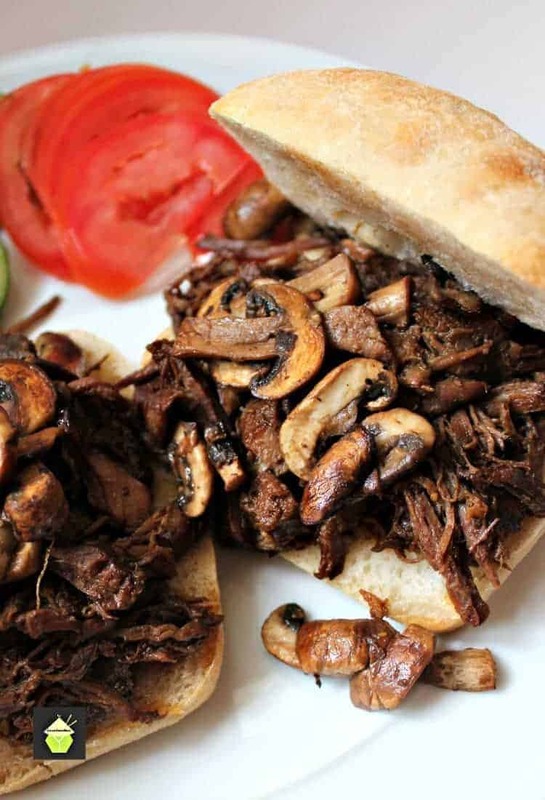 In the photos, I served the pulled beef quite simply, on a toasted ciabatta roll, and fried a few mushrooms to sprinkle on the top. I always think sauteed mushrooms always go wonderfully with beef. Of course this is optional, but it is delicious! This recipe is suitable for making ahead and keeping warm in the slow cooker. I’ve also frozen left overs and reheated them in a saucepan on a low heat and the taste and quality was not affected in any way, so if you wanted to make up portions and freeze, then this will be perfect! I hope you will enjoy it as much as I do, and a big thank you to Cathy for the inspiration! 1 Tablespoon Blueberry Jam or Jelly. Yes, you read that correct. 1. Place the beef in the slow cooker. 2. Whisk all other ingredients together and pour over meat. 3. Cook on low for 8 hours. Test doneness with a fork. It should fall apart easily. 4. When done, place meat in a large mixing bowl. Shred meat with 2 forks and return to crock pot (crock pot should be off). 5. Meanwhile, you can prepare to serve up. Sautee some sliced mushrooms in a frying pan with just a touch of butter. Season with salt and pepper and sautee until they are no longer slimy, but golden brown. 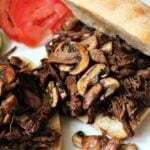 Warm up the ciabatta rolls either in the oven or under the grill/broiler, then serve meat topped with mushrooms on toasted rolls and enjoy! 1 Tablespoon Blueberry Jam or Jelly. Yes you read that correct. Whisk all other ingredients together and pour over meat. Cook on low for 8 hours. Test doneness with a fork. It should fall apart easily. When done, place meat in a large mixing bowl. Shred meat with 2 forks and return to crock pot (crock pot should be off). Meanwhile, you can prepare to serve up. Sautee some sliced mushrooms in a frying pan with just a touch of butter. Season with salt and pepper and sautee until they are no longer slimy, but golden brown. 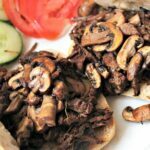 Warm up the ciabatta rolls either in the oven or under the grill/broiler, then serve meat topped with mushrooms on toasted rolls and enjoy!